Archaeologists working at the site of the world's most northerly Roman fort may have found the remains of a key location in Scottish history. The team at Stracathro believe they may have discovered the church where John Balliol abdicated his throne to Edward I in 1296. 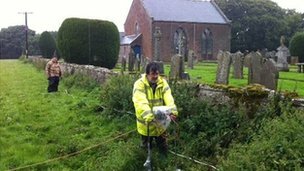 Medieval ruins were found near a roman fort on the Gask Frontier in Angus. Balliol's ceremonial disrobing has been described as one of the saddest hours in Scottish history. The Gask frontier, was a line of forts and watchtowers which predates Hadrian's Wall and stretched from Doune, near Stirling to Stracathro, near Brechin. Dr Birgitta Hoffmann, co-director of at the Roman Gask Project, said the site's Roman history had been what drew them to it: "We were actually going out there to learn more about the Roman fort and the Roman camp that were sitting underneath the church and right next to it." "But that looks in a completely different direction, so when we suddenly found structures that were looking in a different direction, we got excited." The newer ruins were found near to the Roman fort using ground penetrating radar. Dr Hoffman said if it proves to be the site of the Scottish king's abdication it will be a significant discovery: "It's interesting because of its historical connotations, it's also quite interesting that they chose that site. "It's always struck me as rather unusual that they would meet in Stracathro rather than in Brechin, which at the time had the much more impressive church." "If this turns out to be the church it would be interesting to find what made it so special." But she said they may not be able to confirm the historical significance of the site any time soon. Dr Birgitta said they would have to write up the results of the recent find and then have talks to the land's owners and Historic Scotland about what options are available. She said for now the ruins will have to remain underground: "In a perfect world, where money is no object, where money is no difficulty, excavations would be wonderful, but I think we know right know, it doesn't feel like a perfect world." John Balliol was crowned King of Scotland in 1292 after being found to have a superior claim to the the throne to Robert Bruce, 5th Lord of Annandale. However, the signing of a treaty between Scotland and France in 1295, prompted a war with the English King Edward I. The English king invaded Scotland in 1296 and defeated the Scottish army at Dunbar. Records state John Balliol subsequently abdicated at a church near Stracathro. King Edward's invasion resulted in the campaigns for independence lead by William Wallace and later Robert the Bruce.